BHAKTAPUR, Feb 21: Shortage of drinking water during the dry season has started taking a toll on the lives of the people of Bhaktapur. In order to fetch water for daily use, locals have to queue in stone spouts, ponds and other public sources of water for a long time. This has been a regular routine especially for the women and girls here. The inability of Katmandu Upatyaka Khanepani Limited (KUKL) to supply water as per the demand of the city has resulted in water crisis. 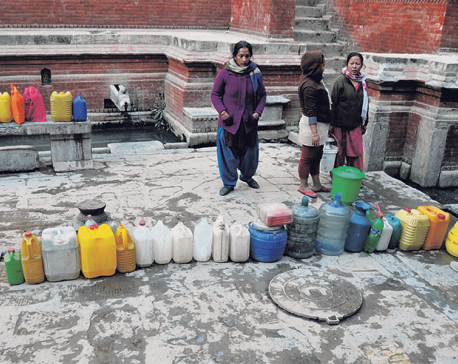 Government records show that there is a demand of around 8 million liters of water in Bhaktapur on a daily basis. However, KUKL has not been able to supply even half of the demand. Currently, it is supplying 3 million liters of water in the district per day. The locals are obliged to wait for hours just to get a jar of water. Krishnashwori Lohala of Taumadhi laments that they sometimes have to stay in queue even during night time to fetch a jar of water. Despite having water taps at their homes, people of Bhaktapur have no option than to fetch water from the traditional stone spouts available at various public places. As per the details provided by a non-governmental organization working for urban drinking water and sanitation, currently, there are 86 traditional stone spouts in Bhaktapur. According to the locals, KUKL has failed to meet the water requirement of Bhaktapur. Locals get water in their own taps only once a week while most of the times they are seen at public taps. Being tired of waiting in queue, some have started buying water from tankers while some rely on jar water. This, in turn, has increased their expenses. Surendra Himalaya, chief of Bhaktapur branch of KUKL, informed that efforts have been taken to solve this problem. According to him, preparations are underway to distribute water in Dudhpati and Sallaghari through boring wells. Mahadev River and Bode are two major sources of water in Bhaktapur.